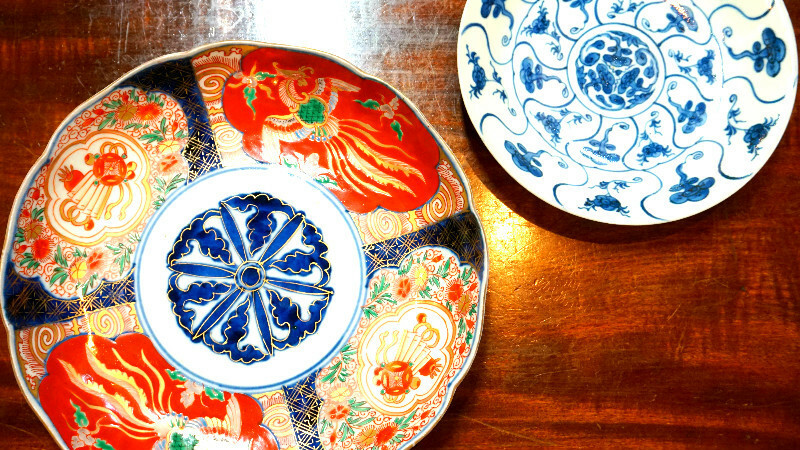 Let's go on an antique loving trip in Kyoto! 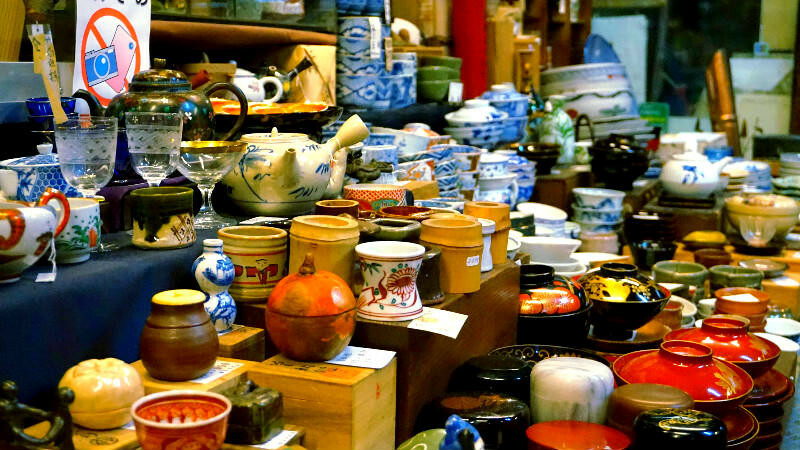 How about going for an antique appreciation trip in Kyoto, where there are many old things? I’m going to introduce 5 shops where you can find great antiques. Things have always been good quality in Kyoto. Antiques are like that too. 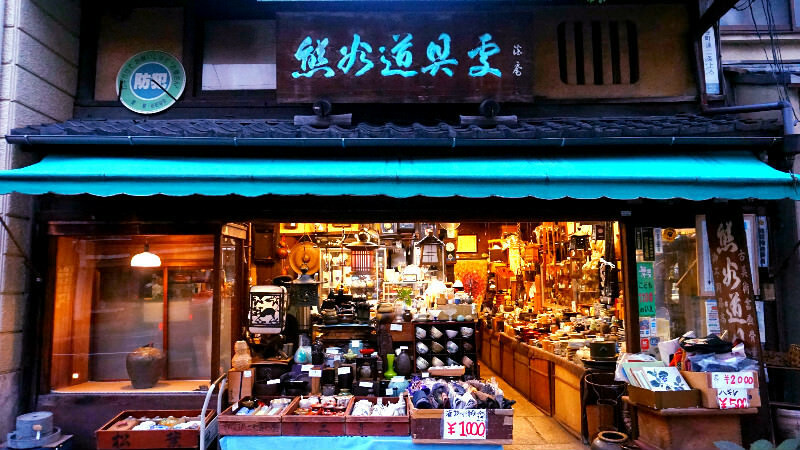 In Kyoto there are small antique shops dealing in good quality antiques everywhere. Many of them are in renovated townhouses and have a quintessentially Kyoto feeling to them. The antiques that were made one by one by hand by the artisans of yesterday were carefully passed from generation to generation. They still retain the warmth of human touch and during these hundreds of years haven’t lost their luster. How about going on a trip to find these antiques that grab our attention so strongly they won’t let go? If you go to the antique shops in this article, I’m sure antiques beginners and aficionados will both find incredibly captivating antiques. First I want to introduce this place, Osugi Shoten! I really like this shop. I wish you will at least visit this shop once. The shop is in an old townhouse which really stands out on the lively street the shop is facing. You may be taken aback by the atmosphere of the shop, but fear not. One of the reasons why Osugi Shoten is so charming is gentle shopkeepers welcoming demeanor. They sell antiques from the Edo period to Meiji and Taisho periods (about 300-100 years ago) and they all have cute different patterns. The shopkeeper has also lived in Hawaii so he can speak fluent English! If you ask the shopkeeper something about antiques, he is ready to kindly explain to you even the finer details, even if you didn’t know that much about antiques. When listening to the shopkeeper talk about antiques, you will become a captive of antiques without even noticing it. Osugi Shoten has a mysterious charm like that. 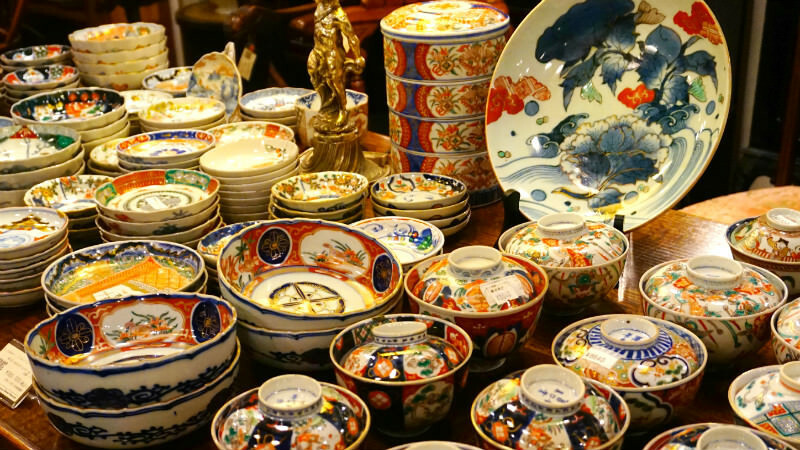 If you are looking for good quality antiques you can use every day, I hope you will first go to Osugi Shoten. 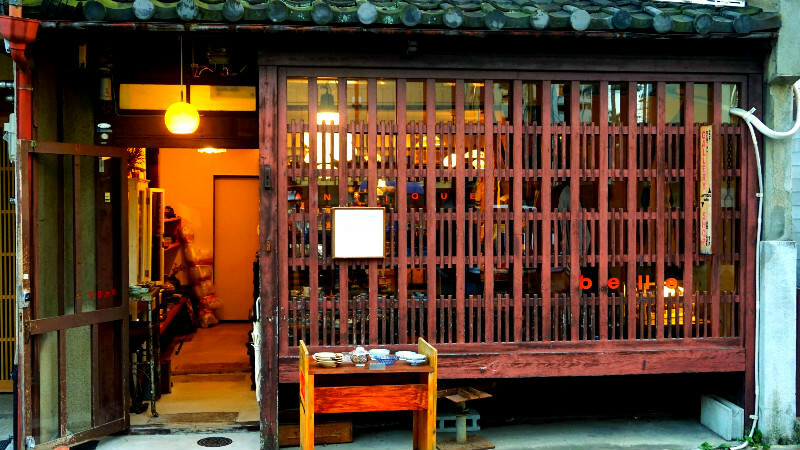 Next, I’m going to introduce the old and established antique shop of Kumagai Dogusho. They have their shop on the antiques and art street of Teramachi-dori. Inside the small store is crammed full of all kinds of antiques and the place is almost like a museum! This is easy to understand when you notice that Kumagai is a “Dogusho,” a shop selling used tools. They sell all kinds of antiques from tools you use every day to games like go and karuta. Being in this shop is so exciting that you almost feel like you had gone back in time to the Japan of old. 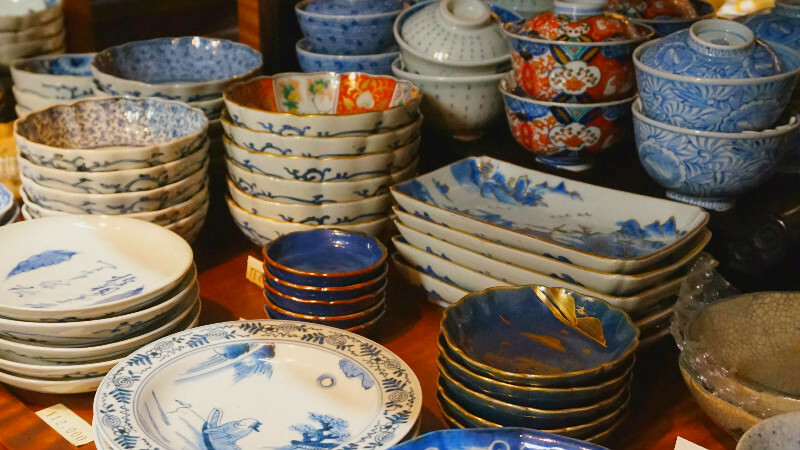 They also sell authentic old Imari and Imari porcelain, and seeing these vivid blues of the Imari porcelains makes you want to take one home with you. 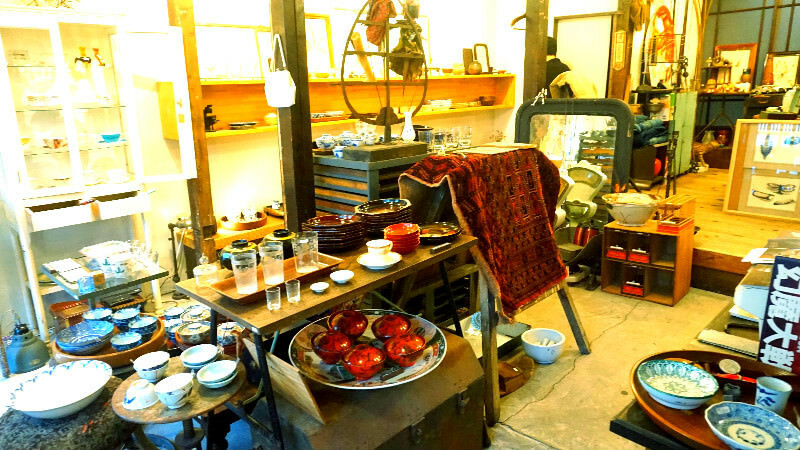 This is a fun antique shop I wish you will pay a visit at if you come to Teramachi-dori Street. Next, we head for the suburbs. Utsuwa Akando is in the same Okazaki area as Heian Jingu Shrine. 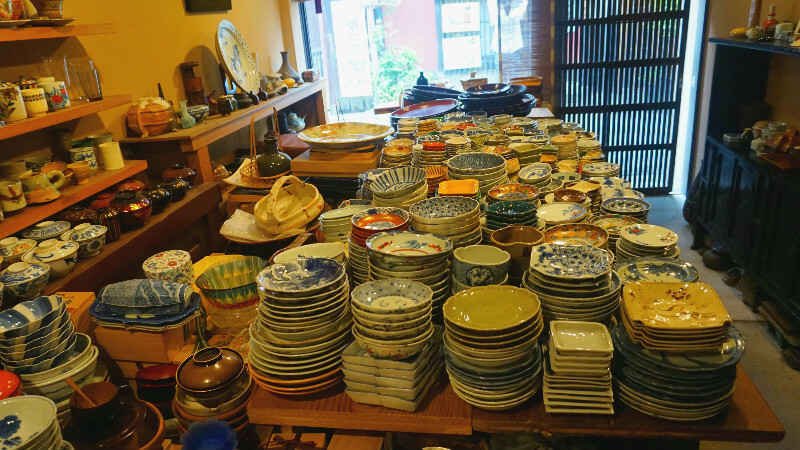 This is a famous antique shop in Kyoto that is even visited by kaiseki restaurant chefs who come here to pick up plates to use in their restaurants. The highlight of this shop is the antiques of all shapes and sizes that are piled high on the tables in the narrow rectangular shop. One of the fascinating points in this shop is the variety; they don’t only sell antiques but also sell porcelain by modern popular potters. 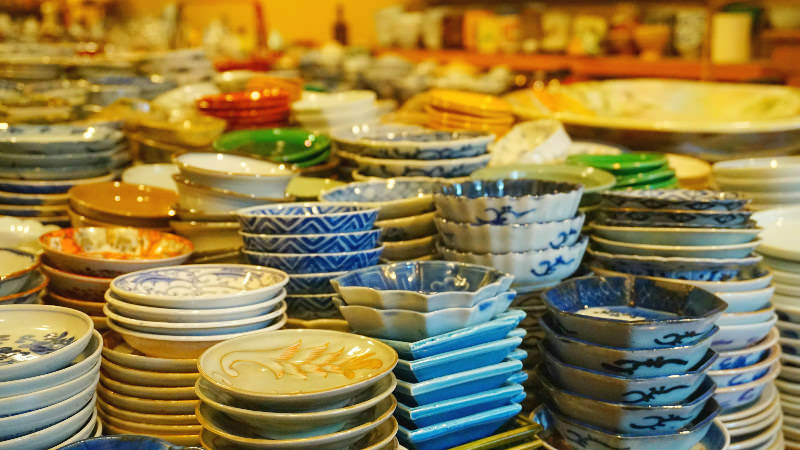 One of the charms of Utsuwa Akando is that you can buy antiques you can use every day for affordable prices. 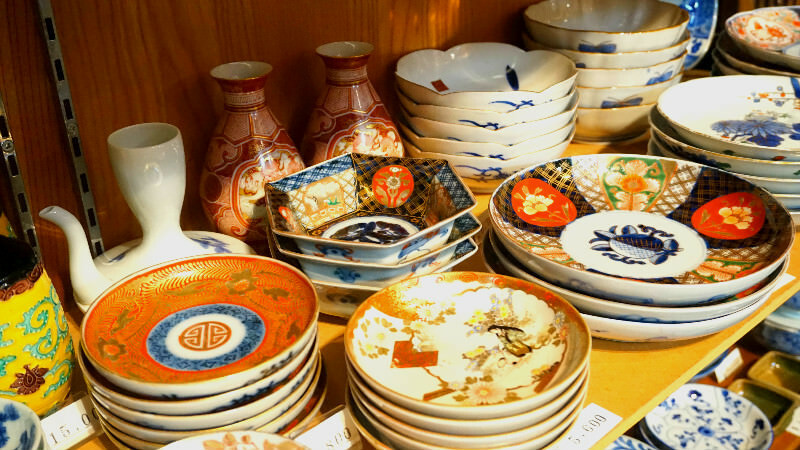 It’s in the Okazaki area with Kyoto Municipal Museum of Art and Heian Jingu Shrine, so if you are sightseeing in Okazaki area, please also pop by Utsuwa Akando! Next, I’m going to introduce an antique shop that is a little bit different: this one is a great little antique shop that looks almost like a Japanese zakka shop from outside. 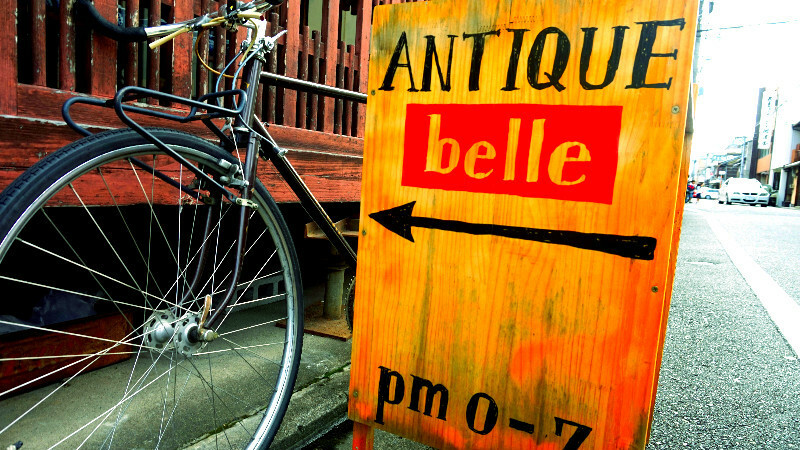 The name of the shop is ANTIQUE belle, and it’s really close to Teramachi Kyogoku Shopping Street. The owner’s cool bicycle and the sign of the shop make it easy to recognize. The place has a welcoming warm atmosphere with a little bit of nostalgia mixed in, and it’s all thanks to the owner who wishes these antiques to be not only displayed but also used. One other special point about ANTIQUE belle is that they have some quaint things on sale too. From expensive antiques to medical and scientific instruments, some of the things on sale look a bit mysterious and it’s hard to know how you would begin to use them. 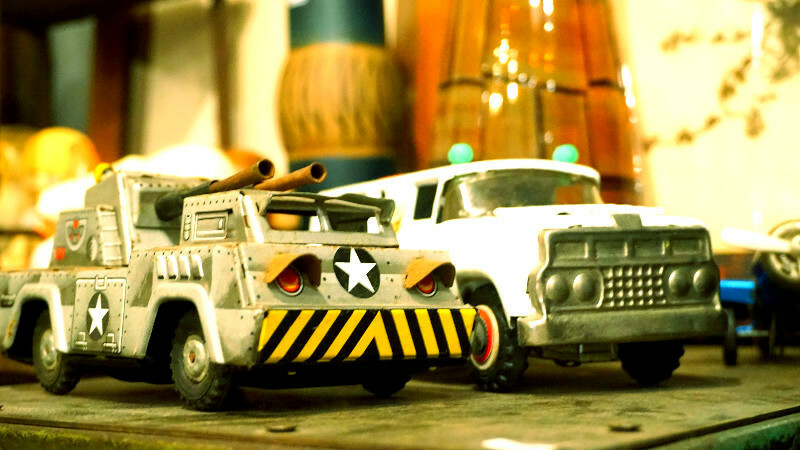 Unlike normal antique shops, here you can take it easy and just look at the antiques on sale. 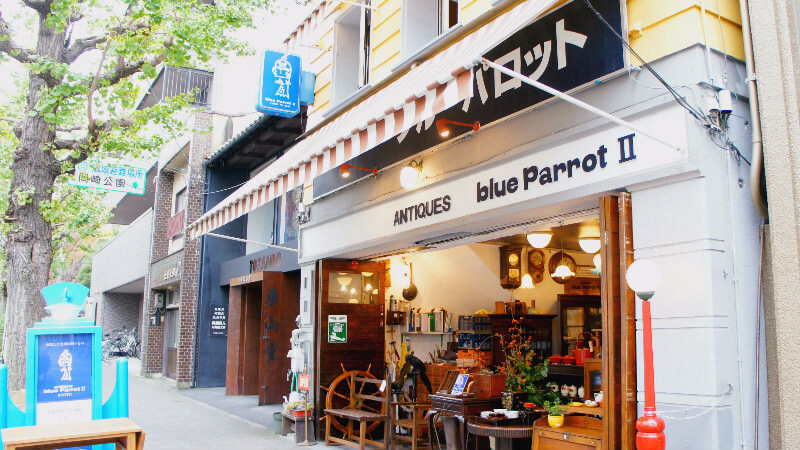 Lastly, I have ANTIQUE blue Parrot in the same area of Okazaki as Utsuwa Akando. 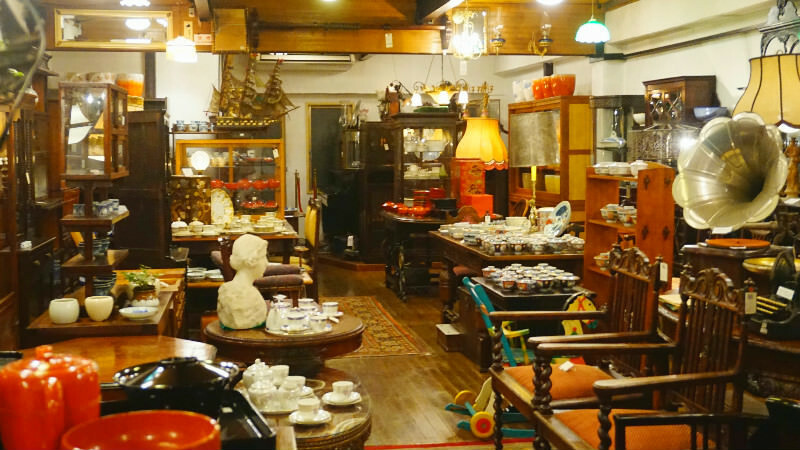 The shop is crammed full of antiques, both Japanese and western, from the first floor to the third. The shop has a really fun atmosphere and the first floor is mainly European antiques; I can guarantee you won’t get bored here. This antique shop is more relaxed and casual than the others I told you about. The staff at the shop also keep a good distance with the customers so the shop feels very welcoming toward antique beginners too. I recommend you hit both Utsuwa Akando and this shop the same day. 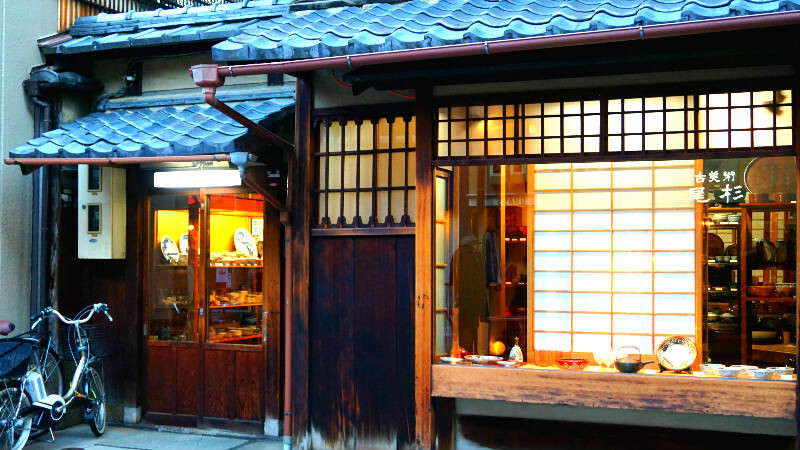 I had no idea Kyoto’s antiques were this charming and fun before coming here! I’m sure you will fall a captive to their charms too. All of the antiques, the colors, and looks are a little bit different; no two are completely the same. 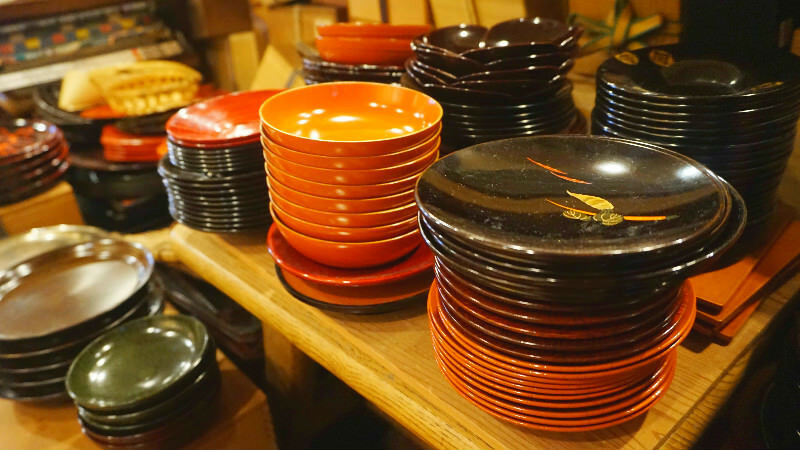 They are completely different from modern mass-produced products, they have some kind of warmth and allure you can only feel when touching them, so how about going on a trip to Kyoto to find these special feelings? 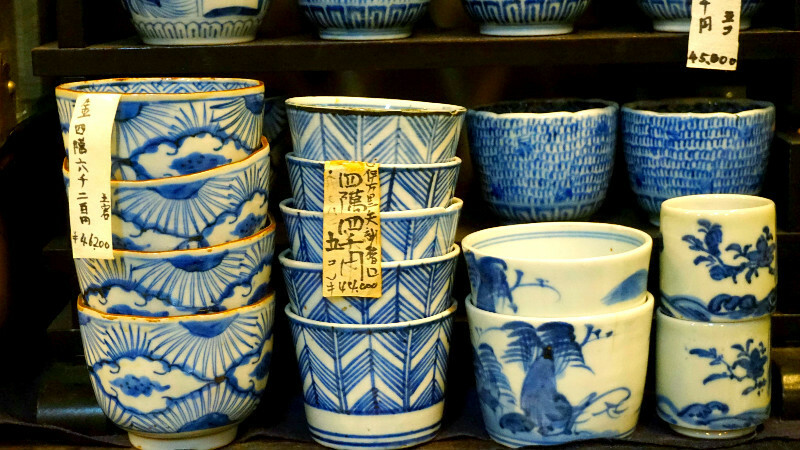 I really would like you to go to antique shops when you come to Kyoto.